Longevity and Value: The American Gem Society was established in 1934 as a professional association of jewelers dedicated to the knowledge and ethical representation of gemstones and jewelry. The Hannon's family of professional jewelers also have serve their customers since 1940 in three different countries. 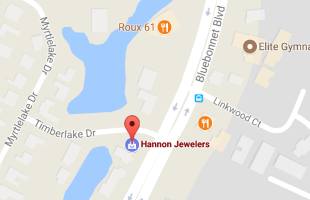 We started Hannon Jewelers in Baton Rouge in 1980. Ethical Business Practices: Members must prove a reputation of integrity and ethics both in the industry and in their community. Professional Credentials: Mr. Bayardo Hannon Jirón's title of Certified Gemologist Appraiser require a deep level of gemological and appraisal education and industry experience. These credentials are earned every year through the successful completion of a re certification exam. Accountability: The tenets of the American Gem Society are: Ethics, Knowledge, and Consumer Protection. 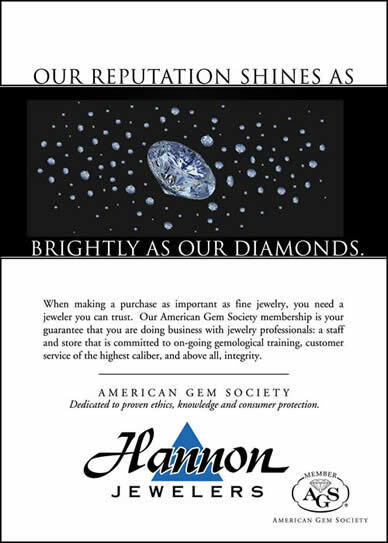 Hannon Jewelers as well as all AGS members are held accountable to these tenets through a commitment to the Society's standards of diamond grading, advertising and appraising. Warren E. Buffett once said: “If you don’t know jewelry, know the jeweler.” However, I would say: "If you don't know jewels, know the jeweler and his associations."